Vincent Bach combined his unique talents as both a musician and an engineer to create brass instruments of unequalled tonal quality. Often copied but never duplicated, Bach instruments today remain the sound choice of artists worldwide. 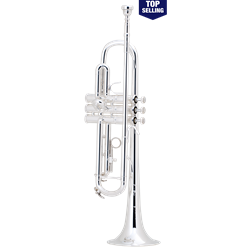 FEATURES The Bach TR200S Bb trumpet is an intermediate trumpet with many professional features. It is made with the standard .459" medium-large bore that is both responsive and focused. The two-piece hand-hammered 4-13/16" yellow brass bell is spun on a professional Bach bell mandrel and is finished off with a soldered bell wire making it extremely responsive with a colorful and broad sound. The professional Monel piston material provides smooth and quick action. The 1st valve thumb saddle makes for easy intonation adjustments. The silver-plate finish provides a controlled brilliance to the overall sound while the deluxe engraving makes for an elegant appearance. The Bach TR200S is well suited for all musical settings. TECH SPECS .459" bore Stradivarius-style valve casing Monel pistons 1st slide thumb saddle Adjustable 3rd slide finger ring Silver-plate finish Bach 7C mouthpiece Woodshell case Available in clear lacquer finish as TR200 FREE SHIPPING with your purchase today!